PLEASE READ ALL OF THE BELOW INFORMATION. ALL SALES ARE FINAL ON CLEARANCE ITEMS. THE PHOTO USED IN PRODUCT IS FOR REPRESENTATION ONLY AND DOES NOT SHOW ACTUAL PRODUCT. PLEASE READ DESCRIPTION BELOW FOR MORE INFORMATION. Has visible scratches and/or dents (Black Powder may have some chipping or bubbling), but is otherwise functional as intended. Fixed 8 foot tall height (96 inches). 1.5" outside diameter aluminum pipe means less weight and easy set-up. 4 slots at 90 degree angles, located at the top and at 3 feet tall, allow for various configurations (such as continuing a linear span, making right angle turns, creating "L" shapes, etc.). This hollow upright works with our Slip-Fit system, allowing for easy installation over a 1.5 inch diameter base pin. This is for the upright only. 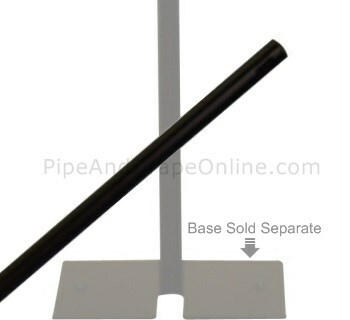 Base and other pipe sold separately. The minimum size/weight base recommended for this upright is our 16" x 14" (10 lb.) base. I am very please with my scratch and dent product the damage is very little at first we didn't think they were scratch and dent, the shipping was fast.